Yes, it's true. It's another Baked cake. I know. You're shocked, right? Actually, I've been wanting to make this cake ever since I first got Baked: New Frontiers in Baking . Every time a birthday or a holiday or some other cake-required celebration comes around, I put it on a list of suggestions and it always gets overlooked! So, when I was asked what kind of cake I wanted for my bday, I immediately picked this one! And I was so glad that I did! So, so yummy! One cake eater/red velvet fan said that it was the best red velvet cake that she have ever had! I have to admit, though, that I liked it a whole lot better the next day. The cinnamon seemed much stronger. I don't know if that's because the flavors needed time to percolate or if I had just eaten too much food prior to cake time. Then again, I often tend to like baked goods more the next day, but that's just me and my weirdness. 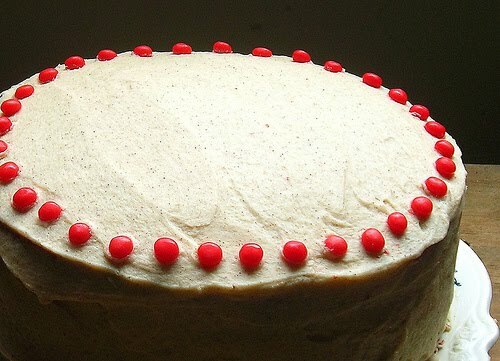 You can find the complete recipe for Red Hot Velvet Cake with Cinnamon Buttercream after the jump. 1. Preheat the oven to 325 degrees F. Butter three 8-inch round cake pans, line the bottoms with parchment paper, and butter the parchment. Dust with flour, and knock out the excess flour. 2. In a medium bowl, whisk together the cocoa powder, food coloring, and boiling water. Set aside to cool. In the bowl of an electric mixer fitted with the paddle attachment, cream the butter and shortening until smooth. Scrape down the bowl and add the sugar. Beat until the mixture is light and fluffy, about 5 minutes. Add the eggs, one at a time, beating well after each addition. 3. Stir the buttermilk and vanilla into the cooled cocoa mixture. Sift the flour and salt together into another medium bowl. With the mixer on low, add the flour mixture, alternating with the cocoa mixture, to the egg mixture in three separate additions, beginning and ending with the flour mixture. Beat until incorporated. In a small bowl, combine the vinegar and baking soda and stir until the baking soda dissolves; the mixture will fizz. Add to the batter and stir until just combined. 4. Divide the batter among the prepared pans and smooth the tops. Bake until a toothpick inserted in the center of each cake comes out clean, about 30 minutes, rotating the pans halfway through the baking time. Transfer the cakes to a wire rack and let cool for 20 minutes. Invert the cakes onto the rack, remove the pans, and let cool completely. Remove the parchment. 1. In a medium heavy-bottomed saucepan, whisk the sugar and flour together. Add the milk and cream and cook over medium heat, whisking occasionally, until the mixture comes to a boil and has thickened, about 20 minutes. 2. Transfer the mixture to the bowl of an electric mixer fitted with the paddle attachment. Beat on high speed until cool. Reduce the speed to low and add the butter; beat until thoroughly incorporated. Increase the speed to medium-high and beat until the frosting is light and fluffy. Add the vanilla and cinnamon and continue mixing until combined. If the frosting is too soft, transfer the bowl to the refrigerator to chill slightly, then beat again until it is the proper consistency. If the frosting is too firm, place the bowl over a pot of simmering water and beat with a wooden spoon until it is the proper consistency. Assemble the cake: Place one cooled cake layer on a serving platter. Trim the top to create a flat surface and evenly spread about 1 1/4 cups of the frosting on top. Top with the next layer, trim and frost the top, then add the third layer. Put the cake in the refrigerator for 15 minutes to firm up the frosting. Frost the sides and top with the remaining frosting. 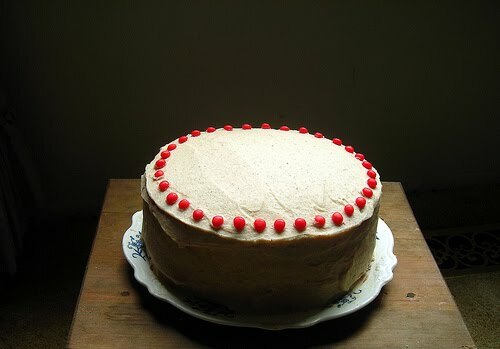 Garnish the cake with the Red Hots and refrigerate again for 15 minutes. 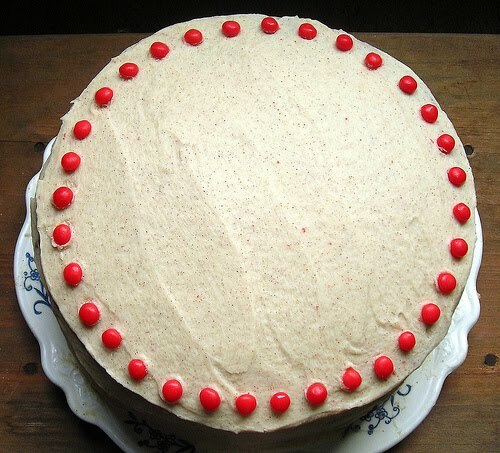 Note: Resist the urge to add extra food coloring to this recipe to achieve a redder cake. Subtlety is a virtue here. The purpose is not to turn the cake or the tongues of the cake eaters a radioactive color. The red in this recipe should be sly, smoky, bricklike, and restrained. Happy birthday Erin! No you are not weird at all, I often find cakes (esp cupcakes) taste much better the next day or at least 8 hours after they're made. I think the flavours have had time to "gel". I've only tried making red velvet cake once and wasn't too sure abotu it, but this one sounds like it's got a little kick to it. Will have to give it a go! Yet another form of buttercream I have never heard of! Sounds great, plus I love cinnamon so I'm sure this would be a hit with me. Thanks for sharing! Hi Erin, your cake looks fantastic! I've made red velvet cake twice in the last month, as a whole cake and as cupcakes. 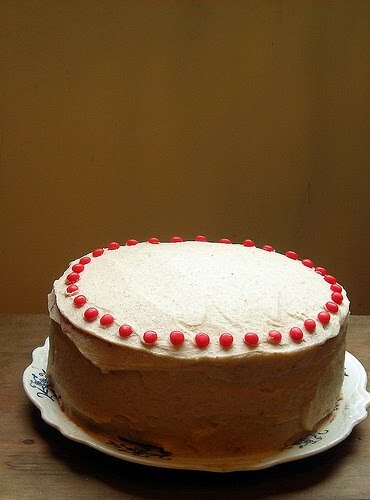 I really like the idea of cinnamon in the buttercream. Must try that!